We were fortunate to get a deal for Naples at the Tampa RV Super Show, so we could take a peek and compare. We were 20 min from the beach compared to an hour in Bowling Green. Our local shops were not just Wally World and Winne Dixie, also the choice of restaurants were more then just Bert’s BBQ or Wendy’s. Four days before we arrived a forest fire broke out surrounding the resort on 3 sides and the resort was evacuated. Fortunately for us, the fire and smoke was gone when we arrived and no-one was harmed. Our neighbor, “T” was a tanned, slim, long-haired beauty, who appeared the following morning as a white, skinny bald man. Each to his/her own. We were finally moved to a pull-thru site, close to the activities and most important the pickleball courts. Unfortunately the golf courses around the area are so expensive, we elected not play and decided to eat well instead. Went to dinner at a fabulous Peruvian restaurant and couldn’t resist Sushi-Thai Too on 5th Avenue ( downtown Naples ) they didn’t disappoint. In summary, Naples is a beautiful city and the park was nice and the people and staff were great. The additional cost to be closer to the beach and outside amenities is awfully tempting, but I assume these campers are not golfers. Everyone at this resort loved it, but I don’t know that it’s for us. 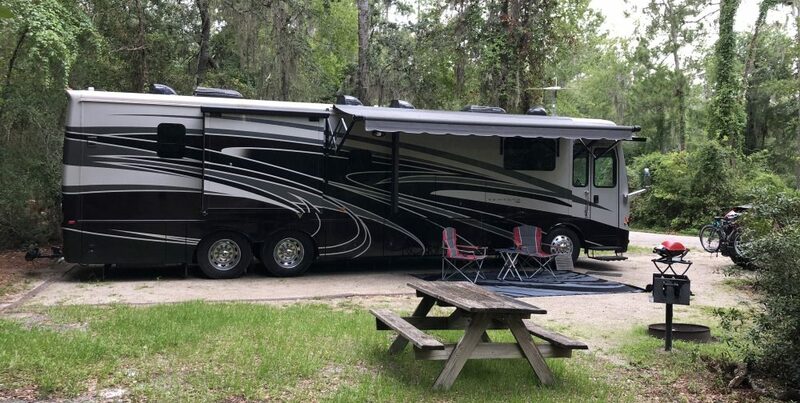 This entry was posted in Florida and tagged Club Naples RV Resort by ssignor2016. Bookmark the permalink.